This illustration from the Akbarnama depicts Akbar, in white at top right of the page, directing the assault of the Mughal army on the Rajput fortress of Ranthambhor in 1569. The Akbarnama was commissioned by the emperor Akbar as the official chronicle of his reign. It was written by his court historian and biographer Abu'l Fazl between 1590 and 1596 and is thought to have been illustrated between about 1592 and 1594 by at least 49 different artists from Akbar's studio. After Akbar's death in 1605, the manuscript remained in the library of his son, Jahangir (r. 1605-1627) and later Shah Jahan (r.1628-1658). The Victoria and Albert Museum purchased it in 1896 from Mrs Frances Clarke, the widow of Major-General John Clarke, who bought it in India while serving as Commissioner of Oudh between 1858 and 1862. 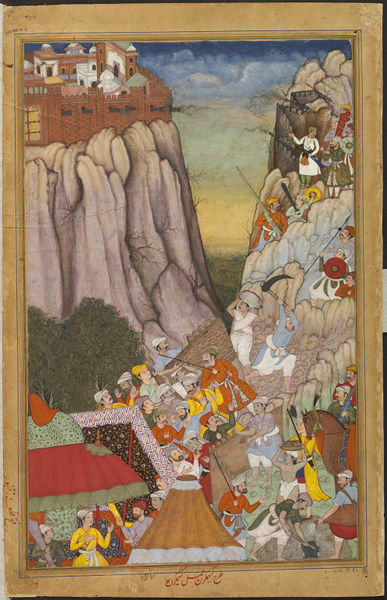 Painting, in opaque watercolour and gold on paper, Akbar (in white, at top right) directing the attack against Rai Surjan Hada at Ranthambhor fort. 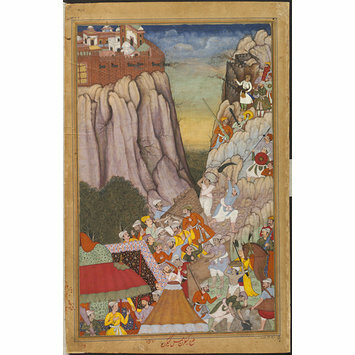 The fort is perched on top of a steep rock cliff, and its guns blaze out across a void at the Mughal troops on the facing rocky outcrop. Tents are pitched at lower left, near the men who are constructing 'sabats', or covered ways, in order to allow the army to move nearer to the enemy. The contemporary attribution in Persian is written in red ink in the margin beneath the picture. The Akbarnama was commissioned by the Emperor Akbar in 1589 as an official chronicle of his reign. It was written by his court historian and biographer Abu'l Fazl between 1590 and 1596, and illustrated by at least forty-nine different artists from Akbar's studio. After Akbar's death, the manuscript remained in the library of his son, Jahangir. The Victoria and Albert Museum purchased it in 1896 from Mrs Frances Clarke, the widow of Major-General John Clarke, who bought it while serving in India as Commissioner of Oudh. Historical significance: It is thought to be the first illustrated copy of the Akbarnama. It drew upon the expertise of some of the best royal painters of the time, many of whom receive special mention by Abu'l Fazl in the A'in-i-Akbari. The inscriptions in red ink on the bottom of the paintings refer to the artists and indicate that this was a royal copy. Susan Stronge, Painting for the Mughal Emperor. The Art of the Book 1560-1650, V&A Publications, 2002, pl. 22, p. 37. Andrew Topsfield, cat. no. 31.
p. 15, cat. no. 7. Composed and painted by Khem Karan.